Caftans are associated with Middle Eastern culture and clothing style of women. Caftans are also known as Kaftans. 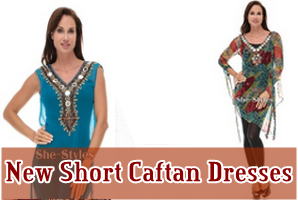 The term caftan and Kaftan has been inspired from the Turkish word Qaftan. Kaftan is a full length attire with full and half sleeves worn by both women and men. The theme and designs of caftan are similar to the voluminous gown of the Middle East called Jalabia. Caftans are probably the simplest type of women's wear you will ever find. Kaftan Dresses are mostly Simple in style but Fashionable and gives a trendy look to the personality. Kaftans are usually like a free flowing outfit worn by women With the draping effect and short top style. The overall look of Kaftan is very breezy cool and stylish. Kaftan is the most comfortably attire that can be wear at home as well as parties. Today i have the awesome collection of Embroidered Kaftan with new style and designs.